Jens Stoltenberg, NATO’s top civilian, cited recent Russian deployments and evoked a Cold War-style threat of nuclear destruction at a global conference of security and defense officials this weekend in Munich, the baroque German metropolis that’s one of Europe’s richest cities. Would Moscow Nuke Russia’s Closest Trade Partners? While Russia has invested greatly in recent years to expand its economic trade with Asia, it is still heavily dependent on trade with Europe. The Harvard Atlas of Economic Complexity reveals not only Europe as the most important region for Russian trade, particularly for Russian exports, but nations like the Netherlands, Germany, and Italy as among Russia’s top trade partners. Russia is currently working with Germany on its Nord Stream 2 pipeline – a pipeline transporting Russian hydrocarbons to Western Europe without passing through politically unstable nations like Ukraine. The project is a keystone of recent Russian efforts to modernize and adapt its hydrocarbon industry around complications arising from US interference across Europe – particularly in the form of the US-engineered 2014 coup in Ukraine and NATO’s constant US-led expansion along Russian borders. And Russian companies aren’t the only ones benefiting from Nord Stream 2 or other economic ties between Russia and Europe. 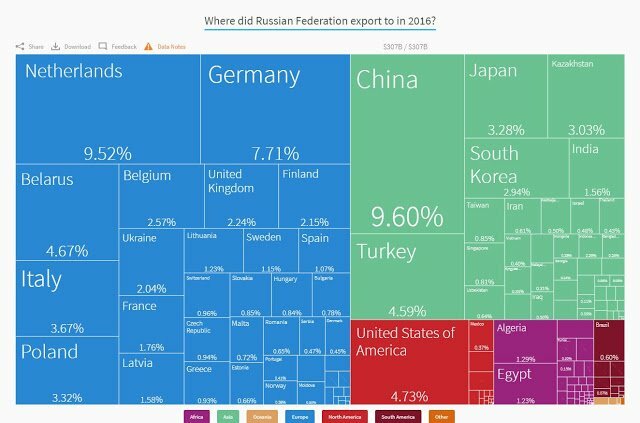 Russia imports more from Germany than any other European nation, and Germany is only second to China among all nations Russia imports goods from. 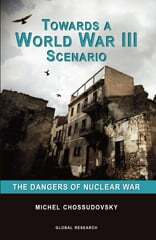 It is highly unlikely Russia is going to launch nuclear missiles at “Munich, with little warning” – because to do so would be entirely without rational justification. Characters like Stoltenberg and the rest of NATO gloss over this obvious gap in their narrative to sell Russia as an unpredictable adversary and an enduring threat to Western Europe, as well as the United States. But by filling in this obvious gap in NATO’s logic, we can see who really benefits from turning Europe into a potential nuclear battlefield by stationing short-range nuclear weapons across the region. It is Washington, not Germany nor Russia that opposes the Nord Stream 2 project. It is Washington who seeks to drive a wedge between Western European and Russian economic trade. It is Washington who seeks to galvanize – or coerce – Europe into a united front against Russia – even if it means compromising regional stability – both in terms of economics and security. Washington – by withdrawing from the INF Treaty – doesn’t jeopardize the security of its own territory – but opens up a new dimension to an already ongoing nuclear arms race in the heart of Western Europe. It will be Western Europeans and Russians who face the consequences that emerge from the abandoning of the INF Treaty and any unpredictable – or even accidental – incidents that result from the stationing of short-range nuclear weapons across the region. As pointed out many times before – NATO itself more than any external threat – represents the greatest danger to its member states in terms of pilfering national treasuries, miring nations in protracted wars and occupations thousands of miles from their own shores, and exposing member nations to the consequences of these wars including the deluge of refugees fleeing to Europe from them. The US – by causing chaos and division both within Europe and between Europe and its trade partners – is able to continue exercising control over the continent – literally an ocean away from Washington DC. The withdrawal from the INF Treaty and the dangerous arms race sure to follow is another example of the US playing the roles of arsonist and fire brigade as a means to maintain the relevance of the international order it constructed over the last century – an order the US serves as the self-appointed leader of. In terms of simple economics and genuine European security – the United States could not be more irrelevant. While Germany maintains the United States as its top export destination – the overall European and Asian regions by far contribute more to the German economy. 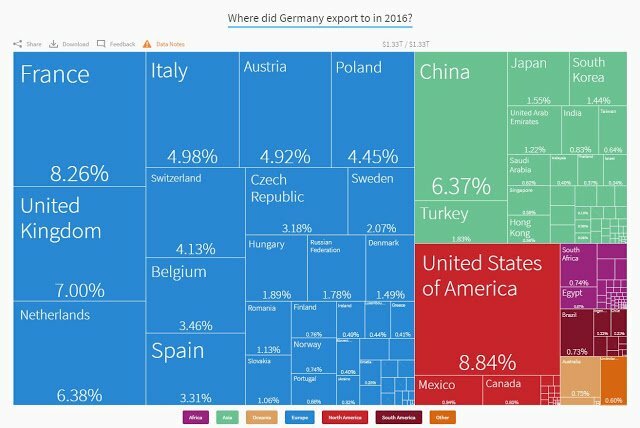 Any instability or crisis in Europe would have an impact on the German economy its trade with the US would in no way compensate for. In terms of imports, the role of the US is even less. While European trade with Russia is relatively small in comparison to inter-European trade, or with partners in Asia or even the US – Russian hydrocarbons serve an important role in European energy security. And while the cutting of ties between Europe and Russia would certainly hurt Russia more – the chaos used to cut those ties may disrupt stability within Europe itself – chaos that would impact inter-European trade – trade that ties with the US or Asia would not compensate for. 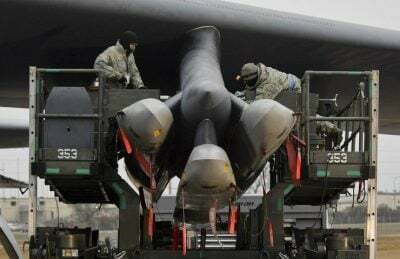 Washington plays a dangerous game, with short-range nuclear missiles being the latest point of leverage it seeks to use in prying Europe away from Russia. It is another illustration of just which nation’s government truly poses the greater threat not only to Europe, but to global peace, security and stability in general.